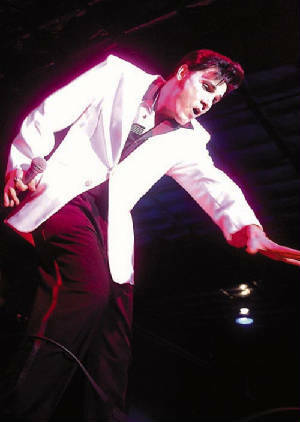 Although only paying tribute to Elvis for a short time, James' love of Elvis began at a very early age. One of James' 1st memories as a child is seeing an old 50's looking mic set up in a church hall, James than proceeded to the mic to belt out the 1st verse of Heart Break Hotel. Like many Elvis Tribute Artist's, James owes his great love of Elvis to his mother who is just about the biggest Elvis Fan in the world and also an avid collector. James now shares the spotlight with his 8 year old son Jackson. Jackson, like his dad enjoys portraying an energetic Elvis (hence the term "A Little More Action Please"). You can see Jackson perform at most of James' shows. James was just recently crowned the 1st Place Grand Prize winner at the Ottawa Elvis Festival and has also been featured multiple times on Lady Luck Music as a Peoples Choice Performer. James and Jackson will be looking forward to meeting all the wonderful Elvis friends and family at the many shows that they perform at through out the year. James has now added the unique stylings of Buddy Holly to his reportoire. James catches the remarkably unique sound and quirky charisma that Buddy had while putting on a Fantastic, highly entertaining show.